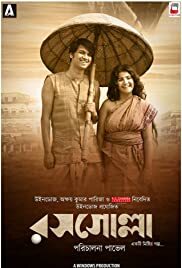 Plot : Based in the backdrop of 19th century Bengal, Rosogolla is a story of a young man with a romantic heart and brilliant mind - Nabin Chandra Das. Nabin had set his heart on making the most delicious sweet of all time for his wife, Khirodmoni. But it was not easy. He faced many trial and tribulations in his journey of making something new and unique. Despite that, he didn't give up on his dreams and finally emerged victorious. Slated to hit the theaters this December, Rosogolla is a story of innocent love, struggle and human aspiration to create something new.